SolidCP Server than only manage Exchange 2016 need domain join? I’m getting ready to install SolidCP 1.0.3, I want only manage Exchange Server 2016 with SolidCP, I don’t want other features (Web Space, FTP, ecc. ecc. ecc. ecc.) at all. I read almost all documentation and all forum threads. What I still don’t understand is if I have to join SolidCP dedicated server to the domain. 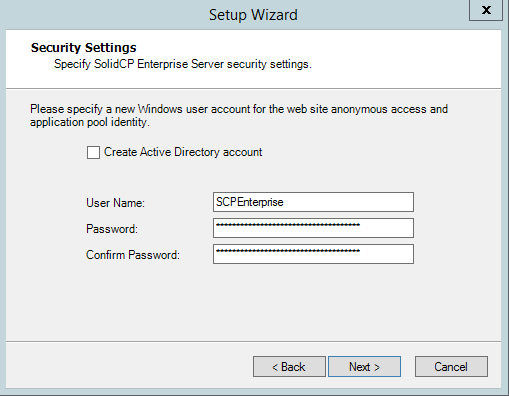 When I first install SolidCP Enterprise server on server (C) system ask me “Please specify a new Windows user account for the web site anonymous access and application pool identitity”, “Create Active Directory account” is show as checkbox, this screen let me deduce that I HAVE to join SolidCP dedicated server to the Domain. Portal and Enterprise is optional to join to the domain. The one that actually executes the commands is the SolidCP Server. that one is obligated to be in the domain with the right permissions to execute things properly. Do note that Cloud Portal and WebDav server (if you ever plan to use it) will require a AD account aswell.